This page contains various assignments and other resources as related to the different lessons covered in this course. If you have been absent or are missing an assignment and it does not have a specific webpage, you might find it here. This section explains the difference between criminal and civil cases and identifies five areas of federal court jurisdiction. This section describes the responsibilites of judges in district courts, explains the functions of United States Courts of Appeals, and identifies and describes the functions of three special federal courts. 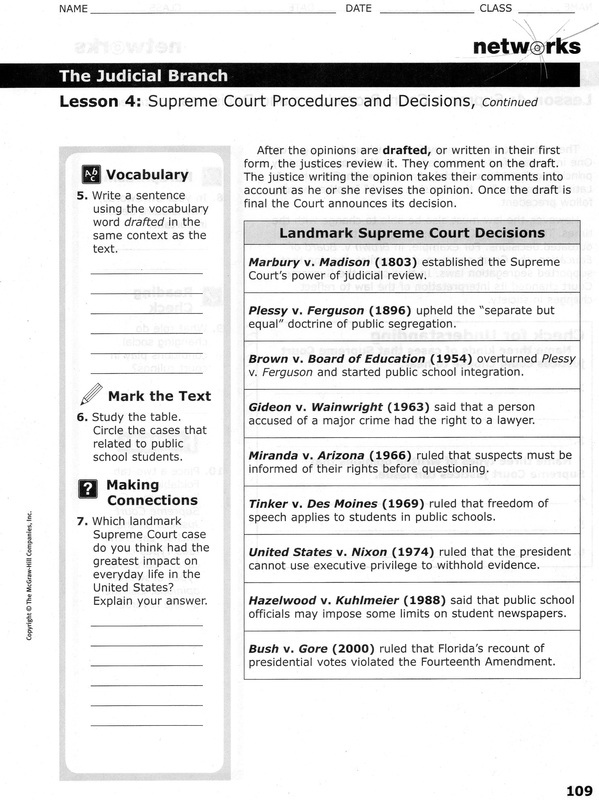 This section explains how the case of Marbury v. Madison affected the power of the Supreme Court and how a President may try to influence the Court through the appointment of Supreme Court justices. 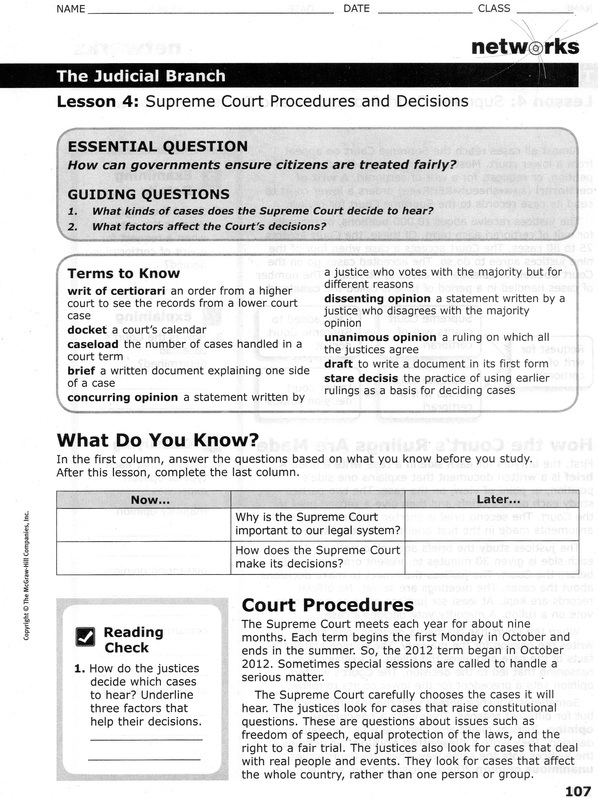 This section explains what the Supreme Court does in deciding which cases to hear, how cases reach the Court from lower courts, and describes how Supreme Court justices arrive at Court decisions and opinions. 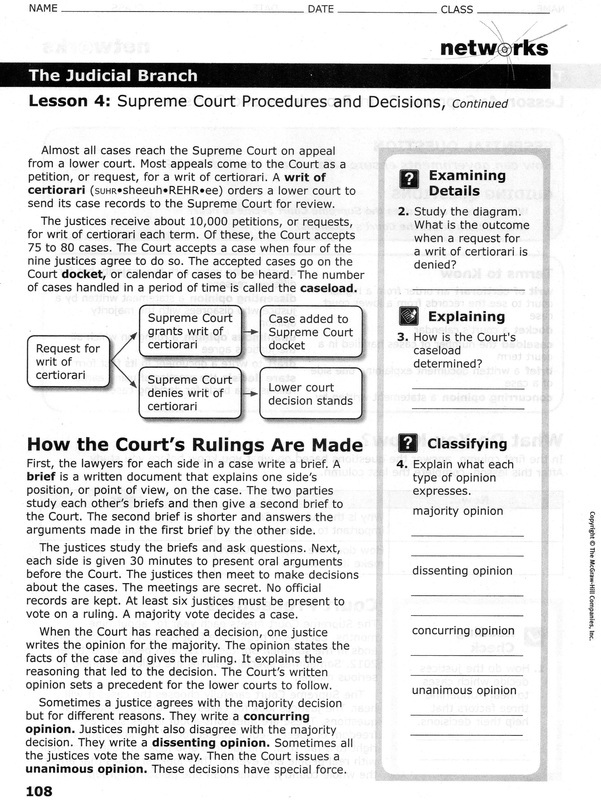 The following assignments were conducted through the course of examination of the Judicial Branch. These assignments were instrumental to the understanding of this branch of government and achieving a grade. They are graded work. Lesson four is displayed below. You can right click on each graphic and print it out to use as a worksheet. Chapter Five and Chapter Fifteen both deal with Citizenship in various ways. They are combined into one unit for this course as they relate so closely together.